My husband just returned from Italy (hurray!) with yet another bicycle (this time a Brompton, his second folder and 4th? bike overall - I don't really follow the details but it makes him happy and keeps us a one-car family - yes really, he's that committed to it that he sold his car years ago) so I've got both cycling and Italy on the brain. What are you all up to this fine (nearly) summer weekend? its going to be wet here so i am going to dash between rain drops getting my weekend errands and beautification done .. today however is a hair cut ... half day Fridays begin again .. and for July/August I'll take Fridays off .. hooray for summer! I remember when I visited Rome a couple of years ago. I didn't have my bike with me, but if I ever go back, I will be sure to bring it along. I did 10 miles this morning on my bike so I definitely empathize with your hubs. Cleaned up now and awaiting a repair guy. But it's a cool 70 and BEAUTIFUL outside so bearable. your life is just too damn glamourous woman! 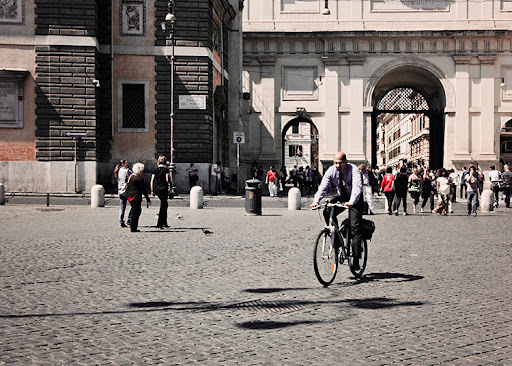 Yes, riding in the piazza looks a lot safer than on our streets (or sidewalks). Watching the rain, Robin! Surprise surprise! Oh, and lighting the fire (what month is it?) to keep warm. Yes, I'm serious. But then today, Sun came back, and we could go back to short sleeves; nothing like a bit of confusion and variety. Bloom Festival was on, I went, forgot both camera and phone so no photos, but I will take some tomorrow (assuming it doesn't rain all day!) of the lovely things I bought! Hope you had a good BBQ. And your photo is beautiful, I agree with your sentiments about his commute.